Quick update on growing tobacco in SIPs (sub irrigated planters), a project started by a friend this spring and carried forth by a village of curious folk. 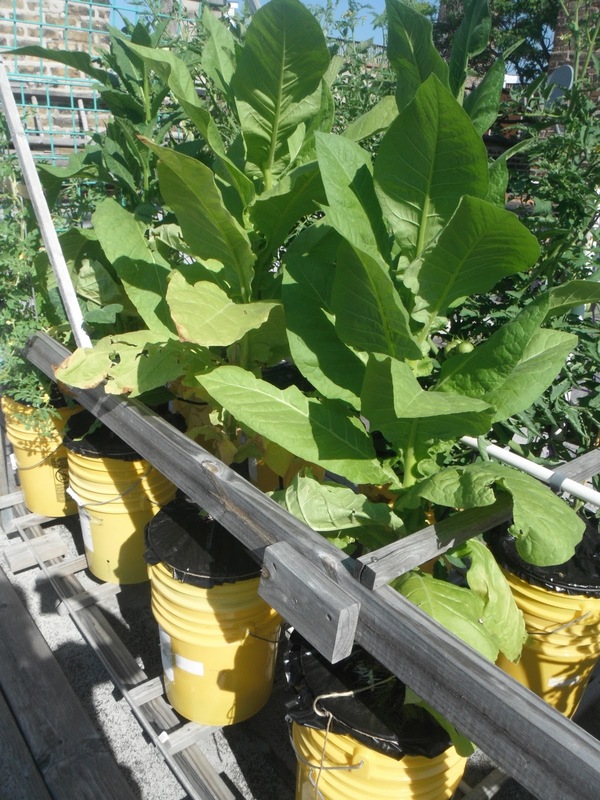 Cut to the chase: tobacco loves sub irrigation. Part of the harvest, drying upstairs, from our roof and Bruce's. can you describe the drying and rolling process a bit more? I've dried a lot, but haven't had much luck at rolling. Asked my bro for some info on this and will post shortly. Your blog is very informative.A cigar pipe 3 to 5 inch tobacco cigar pipe come .Different types, watermelon chocolate, black cherry cognac . Thanks for sharing your posts. Thanks for sharing a info . I'm live in Florida and I'm cursed with a fine sand soil and am hoping to use SIPs this coming grow season to grow some dark air cured tobaccos that normally would require a silt loam or silty clay loam soil. I'm interested in finding out what you used in growing media mix and what variety of tobacco seed you used. ...you can view a photo showing the tobacco seed varieties we grew. To grow in SIPs, we use potting MIX (not potting soil) or a blend of peat and perlite. Earthbox has a nice round-up on commercially available potting mixes. Good luck! Sorry about missing the followup blogpost that would have answered my question on the varieties. Tobacco is very picky about how it is grown. Each variety of tobacco has its own character that is a result of its specific local soil conditions and climate. Flue cured might come from the sandy soils of Virginia, while the Dark Air Cured comes from a silt loam soil in Kentucky, the wrappers grown in Connecticut and fillers from Wisconsin...etc etc. 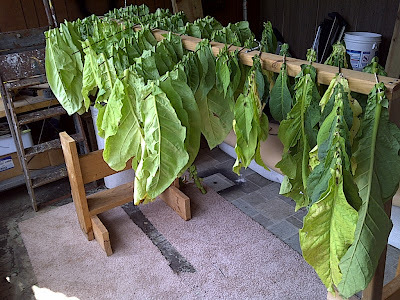 If you grow that same variety in a different type of soil you will get a completely different tasting tobacco. I'm sure changing the formula of the media mix will also change the taste of the tobacco variety we are growing. Your answer to my question was kind of like saying when you make Coca-Cola you can make it with any number from a list of sweeteners (cane sugar, HFCS, honey, or molasses)and they will all taste like Coca-Cola. What I'm trying to do is determine what the formula of mix you used is, so we atleast have a starting point of a mix works. Then once we have a starting point, then we can experiment with that media mix formula by changing things like; the moisture content, or porosity of the media mix, or maybe add some dolomite, or some other variable, and see how that variety responds to changes in the media mix. That way we can begin to try to approximate the characteristics of the resulting tobacco as if had been grown in its own native soil type. i.e. if you want to grow DAC tobacco use formula A, if you want flue cured use formula B, if you want to grow cigar wrapper use formula C.... etc etc. Now I see. We used peat + perlite for the mix. I use a generous amount of perlite to lighten the mix, but can't say exactly how much, sorry. We used a balanced fertilizer. Nothing else was added. hope this helps! Oh, wow. So you can even grow tobacco in a green roof? That sounds pretty good! I can imagine it now: enjoying a good smoke in the comfort of the green roof garden, perhaps with a good drink in hand!